Friday morning I missed most of the keynote: I didn’t have any corporate breakfasts to go to and my brain wanted sleep from all the early mornings and late nights. I went in for the last few minutes, before queuing with everyone else for the opening of the third day of the Careers fair, and my final booked interview, which was with *dundundunnnn*…Facebook. I felt this went well, which I have to say is a shock: for anyone else who’s considered not interviewing with the big companies because of the tech interview, do it, but look over the various blogs and questions people have out there. Preparation I think this time around (I did a practice with Google in February which I sucked at) was key to making me understand the process and feel ok about it: the blog that helped me was from Cate Huston which was pretty much exactly what I needed – a list. She also gave me moral support over twitter and the advice “find a way to stay calm”, which are words to live by. Of all the books I purchased in the two weeks I had notice of the interview, Programming Interviews Exposed is the one that prepared me the most. I had serious difficulty not looking at the answer and puzzling out everything myself, and for most I just read the answer, but because of the style it’s written – aka breaking down the problem piece by piece, writing out the algorithm in text, and then writing code and refactoring – this helped to get into my head how to go through the interview. Key piece of advice: talk before reaching for the paper/whiteboard, and if you’re stuck, say why you’re stuck and see if you can get any tips. Whether or not the interview went well, I walked out smiling and thought I did my best, and here’s a shock: I enjoyed it. – Wearables talk: went along to see some presentations on wearables, including an interesting one on swim watches and reading from them on windows phone. I said goodbye to my new friends, and despite only knowing them a couple of days felt sad to not know when I’d see them again. By the power of the internet though I’m sure we’ll stay in touch. The following day, my housemate and I got breakfast at our hotel and headed out to try and find a shopping center: I took far too many dollars for a conference where almost everything was free, and where I had to pay for anything it was done using a prepaid debit card given by ABI/my sponsor. Due to this (after not finding any shops, whatsoever!) I headed to the airport a bit late, and almost missed my flight. Whoops! I had a brilliant few days at Grace Hopper, and despite the work and stress catching up on things I’d missed, I would recommend this to any of my friends as it’s an awesome experience…just don’t go to Phoenix for shopping, although next year it will be Houston and the following year, Memphis. A big thanks to everyone who made my trip possible, and all the people at GHC who made my experience so awesome. Continuing from my previous blog, day 2: day 3 will be a further post. Following this the keynote from Satya Nadella: whilst this was a huge thing in itself, being the first male to keynote at Grace Hopper, one answer made the story a huge controversy all over the internet, and much of what he said here got a little twisted. The keynote was a chat with him and Maria Kawe, director/president of Harvey Mudd College. One of the many questions was “what would you say to a woman who is too scared to negotiate her pay?”. For anyone not aware of this problem, there’s quite a big pay gap between men and women, (i”‘ll look up figures and references in a minute) and most think this is due to women’s under confidence at negotiating their initial pay, and asking for raises. To this Satya said something along the lines of “perhaps this is a good thing: if you don’t negotiate, karma will come back and help you eventually” (paraphrasing). Online the media went crazy and this has been posed as his first gaffe as CEO…to the point where fellow scholars posted things like “I hope he resigns”. I found this a massive overreaction, and one which gives me cause for concern: we should all remember Satya coming to speak at GHC, and saying in an email to his employees that he was here to listen and learn, is a huge statement on his part that he is committed to supporting and changing the status quo of women being a minority. – my first interview: I felt this went well, and generally after sitting feeling wracked with nerves beforehand I felt comfortable once the questions began. – A wander round the career fair: the trouble with GHC is its hard not to get sucked into the career fair, because there’s so many stands to visit and people to talk to. I appreciated this opportunity a lot now because I’m graduating summer 2015, so for me having a lot of big name employers in a room was brilliant and let’s hope something comes back from them. You could however, spend 2.5 days in there and miss all the cool sessions really easily. – my first visit to Hard Rock Cafe. Like. Ever: Lunch was with 2 execs from my sponsor, Nationwide Insurance who I’m very thankful to for everything, and the 3 other ladies they sponsored. We had a good chat and its nice to talk to two real women about work life balance and how they got where they are, and at the end of it we booked in an interview for that day. – More career fairing. I wasn’t lying about it sucking me in! – interview with nationwide as above, went pretty well. Whilst I don’t know an awful lot about VMware, the party was pretty awesome and here I met a couple of girls I got on really well with, who I then went for dinner with the next night. I also met a very nice lady from VMWare who sat chatting with us and gave me some advice on how to deal with people who have bad or sexist views and air them, loudly. (The tip was just say “excuse me?” Or “you don’t really believe that, do you?” Whether this works, we’ll find out!). She also pushed me to think about what I want to do when I graduate which I’ve been asked so much in the last 6 months I’ve lost count. The deadline was a month for me to tell her exactly what I wanted. No idea if I’ll make that. Following this I headed outside with the girls I’d met and bumped into Maria Klawe I mentioned earlier: we took a few photos and she again gave us some insight and inspiration for continuing, before heading home. We moved on to the evening dance party, where I bumped into Anne-Marie Imafidon and her clan of Stemettes, which was nice: even after two days of being around another culture, receiving “oh you’re from England that’s so cool, how long was your flight?” 20 times a day was tiring. Having been flying since 1.30pm Arizona Time Saturday, I finally got back to Hull around 6 or 7pm GMT Sunday, and whilst that was a very long journey back, the 3 days I spent at the conference were brilliant and definitely worth going for. Looking at my stack of work, I’d much rather write about why than actually do my work, so here we are. It all began on Tuesday, arriving at Phoenix Airport via Amsterdam and Minneapolis, where I met up with my room mate, picked up my badge and other swag from the conference, and went over to the meet and greet with the other scholars. This gave us all time to get better acquainted with each other and with the program managers, Tina Pratt and Elizabeth Bolin, as well as meet several of the Anita Borg Institute staff who organised the conference. The next morning my room mate and I attended the Facebook sponsored breakfast, put on for anyone interviewing with Facebook, working there or who had received a scholarship to attend through Facebook. I expected this to be a little more nerve racking than it was, but it helped to calm my nerves of the next few days and of the upcoming interview on Friday, and in general the atmosphere was of openness and community, so a great way to kick off. – The opening plenary with CEO Telle Whitney and head of the ACM Alexander Wolfe, followed by ABIE award presentations and an awesome keynote from Shafi Gosswasser, a noted cryptography researcher. Unfortunately, I wasn’t one of the lucky ones, but nevertheless enjoyed my time at the lunch and found the discussions very rewarding. The Student Opportunity Lab: I attended a session in here on cybersecurity and one on data science. I thought they were good, but neither really brought out my passion for either job option – whilst they were very factual and defined that the areas are useful and that every area has it’s needs for both, I was looking for something more to show me “this is why it’s fun and why I’m passionate about it”. Afterward I headed in to the career fair for a couple of hours: I’d somehow managed to forget my CVs which are a vital part of the career fair as a lot of the stands will ask you questions based on what’s on it, but for the few that I went to I gave them business cards. After dinner I headed back to the hotel to chill for a while, and print some more CVs as I predicted I would run out the next day. As this is already a very long blog with just those two days, I’ll cover Thursday/Friday/my journey back Saturday in another post, and in the meantime try and dig out the photos I took of talks and such during the first couple of days. Around April this year I applied for a travel scholarship to GHC, a massive conference in the US that celebrates and supports Women in Technology. July of this year I found out that I was in the 26% of applicants to receive the scholarship (as far as I know, I’m one of 2 UK residents to receive it, and the other attends Oxford University…so it’s kind of a huge deal and I still can’t believe I’m going), and for the past few weeks I’ve been preparing for interviews, networking, the career fair and spending 4 days in 30 degree heat (thank fully, the conference center and hotel have air conditioning). I’m flying out to Phoenix Tuesday morning (I’m actually doing pretty much a zigzag across the EU and USA: Hull to Manchester, Manchester to Amsterdam, Amsterdam to Minneapolis, Minneapolis to Phoenix) and there’s a meet and greet that evening with my fellow scholars, so this week is going to be pretty exciting. This is in the midst of preparing for final year, writing electronics projects for various boards, attending a bunch of meetings for Come Dine with Me and becoming a Computer Science Demonstrator, and well…drinking lots of…apple…juice. I’ve also begun my final year project by producing a plan which has made me appreciate how big this project will be (but also how awesome it will be if I can actually pull it off and get in all the cool features I want in it): for those that don’t remember, I’m making a sheet music library, which reads, renders, edits and writes MusicXML, organises your files by Composer, instrument, and whatever else may be useful, and hopefully: converts it to MIDI for playback and converts flat images (for example, scanned in sheet music) to MusicXML. The last two are kind of *I hope there’s time* points, but if I don’t have time to fit them in, I’ll be open sourcing the project and hopefully working on it more when I graduate. I like this project a lot because this is something I’ve wanted for a while: for composition there’s Sibelius and Musescore, but I’d like something which does composition, storage, organisation and accompaniment generation all in one, in a similar way to Spotify being my go-to app for music. If doable, I’ll be writing this in Python because I’m most comfortable with that language right now, which means that once finished, I should be able to port it to Raspberry Pi so I can carry around my sheet music in my handbag. Something else I’d love to integrate would be cloud storage and integration with huge free music libraries like the IMSLP and the MuseScore community (IMSLP is a project which collects sheet music online from composers whose copyright has officially expired: so…most of the very famous composers’ work is on there, though the formats are still questionable and I’m not sure they have an API for me to poke at). This is probably a pipe dream, and I don’t know what the copyright ruling would be (sheet music copyright is even more of an issue than regular recorded music copyright), but it would be nice to have. My other modules this term are Virtual Environments and Languages and Compilers: the latter enables me to learn C in a properly taught way – I know C to an extent, but it’s not on my CV, for example, so it’ll be nice to learn it properly and get the opportunity to apply it. I realised yesterday, as a few second years from my university were discussing EMF 2016, that I hadn’t yet written about this particular event. As a brief intro, EMF Camp is kind of like Glastonbury for Geeks. That’s great for someone who’s been to Glastonbury, or in fact any musical festival, but erm. I…haven’t. So I had absolutely no idea what to expect and had only discovered this event about a month before. Essentially, the idea is Hacking in Tents over 3 days (EMF stands for Electromagnetic Field, by the way…). Over 1000 makers, hackers and creators of any sort descend on a field together, show off what they’ve been making and teach others how to do the same. At EMF this year there were several workshops, ranging from creating the One Ring to laser cutting a useless contraption. So I headed down from Hull on Saturday afternoon, tent, Raspberry Pi and various random components in tow, and set up camp. I knew a handful of people from Pi circles attending and another handful from the Bristol Hackspace attending, so as I wandered round I bumped into a few familiar faces and overall, had a really great time hanging out with old friends (I say old – I’ve been into electronics hacking for about two years now, and doing it socially for probably a year or less) and meeting some new ones. The first afternoon I attended the Simon Singh talk on the Enigma machine: I found this a really great talk and he explained everything well. I’ve been to Bletchley Park maybe 2 years ago, but some of the information had dissipated from my brain. Later that evening we headed over to the BarBot created by Nottingham Hackspace: a robot which mixes cocktails, the ordering of which being online. Despite the cocktails tasting…pretty bad, the amount of LEDs which some would deem unnecessary in drinks making means I thought this was an awesome project, and the generosity of Nottingham Hackspace to offer these without forcing payment is pretty generous: I did donate, like a good person, of course. Before turning in for the night I headed over to the main stage tent to see what music had been put on for the eve: terrible rave music along with lasers and smoke machines. Standard. The following day was meeting some new faces – among those, Chris from Element14 and Rachel from Raspberry Pi who I’d been meaning to meet for a while. Her Zoe talk was pretty interesting. Disapointed in myself that I missed the opportunity to throw things at Ben Nuttall, who was a few rows in front, as Carrie Anne deemed necessary to point out. My last talk of the event was the panel session discussing the badges. If you’re unfamiliar, in 2012 EMF Camp volunteers decided to make a super awesome badge ready for 2014: the idea was ace, in practice…not quite as great, due to problems with sponsorship, hardware manufacture hitting a few roadblocks and various other issues which were covered in the talk. Nonetheless the badges provided everyone with a device to hack, with lots of hardware which would have otherwise cost a fair amount, and all software for both the badges and the server they intended to have working for the event was open sourced. Jonty, the main organiser, also announced that there would be a competition for the best hack, with the prize being tickets to EMF 2016 and the one day EMW (electromagnetic Wave…it’s held on a boat in London…get it?! Wave?!) event. The overwhelming brilliance of the camp is that all of it is volunteer based, from the badges to the organisation to security on the gate – it’s as open source as it gets. I really enjoyed it and will definitely be going in 2016 assuming I’m in the country. In my last couple of microview blogs I posed the idea of making a removable circuit – meaning something to put a microview into which you can then take it out without requiring desoldering, and more importantly, without cutting off the microview pins. @charwarz female headers. Then cut off the header pins? @charwarz the DIP socket adaptor and cut the pins off would be the most simple and cheap option, don't use the wire round ones. The current winner is the final one by Grahame, mostly because I already had a dip socket with 14 inputs I wasn’t using. 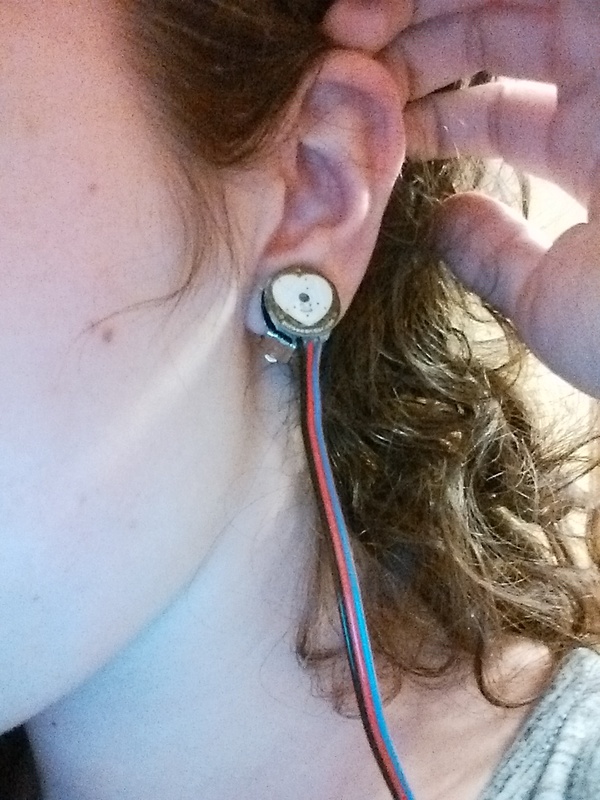 I then got my soldering iron and stripper (whitwoo), cut off the ends of my heart rate sensor: I measured these so that it makes a circuit necklace similar to the necklace I made for york Raspberry Jam by placing the Microview in the center of my chest and pulling the wires to where they needed to be. Next steps after this are to put in a battery: I currently have one LiPo with me from my metawear kit I could repurpose: not sure where the best place to put this in is, possibly round the back of my neck again. I also want to make the positioning of the microview more stable. Ooh and for those who didn’t check my twitter: I’ve also released the code for this project on github. …the wrong way round. Whoops. Luckily its only velcro’d on. Anyhow, this sensor got given to me by Craig for Christmas, and well. Its been 9 months. 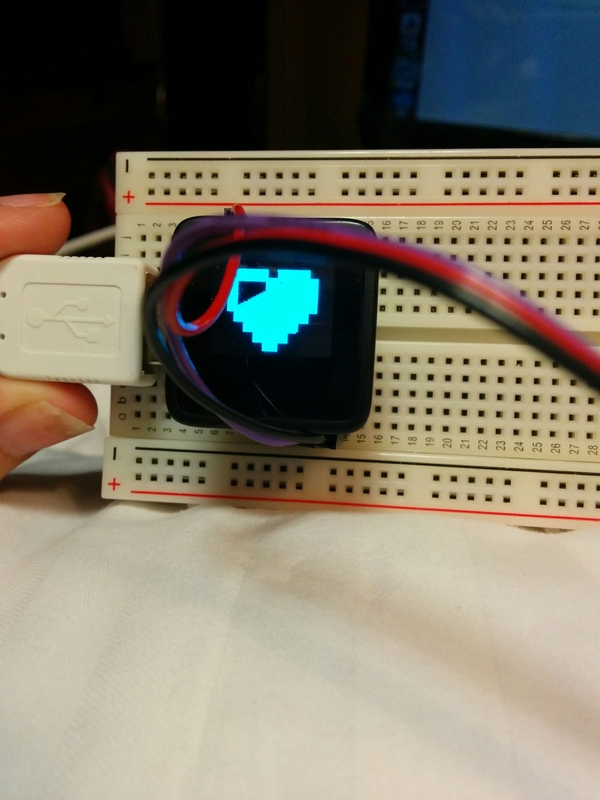 Having seen the microview video feature a blinking heart, I decided I’d use it for that purpose. I actually cheated here a lot: I pinched the example code from sparkfun’s library and the example code from pulsesensor.com’s library and smashed them together. The result works pretty well, I just need to figure out a way to make a nonpermanent necklace mod to the microview. With push the code to github in the morning! Also my metawear board arrived: not really sure what to think? Have yet to utilise that little guy yet. A couple of years ago I travelled from Bulgaria to Germany, skipped France and every country in between and flew to Spain. I think I probably wrote a blog post in every city. This trip I haven’t for various reasons. FYI this time I did Helsinki (Finland), ferry to Stockholm (Sweden), train to Malmo (Sweden), a 3 hour stop in Copenhagen (Denmark) and then a train to Hamburg (Germany – that train went on a ferry and it still freaks me out), train to Cologne (Germany) and finally, Amsterdam (The Netherlands). All in a period of 12 days. Its been a really nice trip, some awesome people met, far too much alcohol drunk and money spent. I’m flying back to Manchester later today, and then driving back to Sheffield in the morning. Next up? Leeds on Friday to drop into Farnell to do some work, Hull in the evening for a friend’s birthday, Bletchley on Saturday for Electromagnetic Field Camp which I’m so excited for, and then Bingley for two weeks to work at an educational ISP. Hull is then getting me for at max 2 weeks before I head to Phoenix, Arizona for the Grace Hopper Conference. Quite looking forward to being in one place for more than 2 weeks.. These will be up weekly, however from next week I’ll be away travelling so replies to comments will be a little slower. Pi Passport now on Element14! A few months back myself, Ryan (@ryanteck), Craig (@craigargh) and a few other friendly faces were talking about a project we since referred to as Pi Passport. We planned out the idea, and then kind of dropped it for a long time. If anyone’s been asking about my review of the NFC board I tweeted photos of a while back, this is it. Hopefully when I have more time I will work with the board again, but using full NFC data transfer as the board I have can also send information.